Welcome back to Start Small with Video. I’m Zach and I’m here to help you start small with making great videos by yourself for your business, and with the camera you already have with you. So far we’ve covered tips for shooting stable footage, editing your videos faster, where to share them online and practical steps for planning your videos. 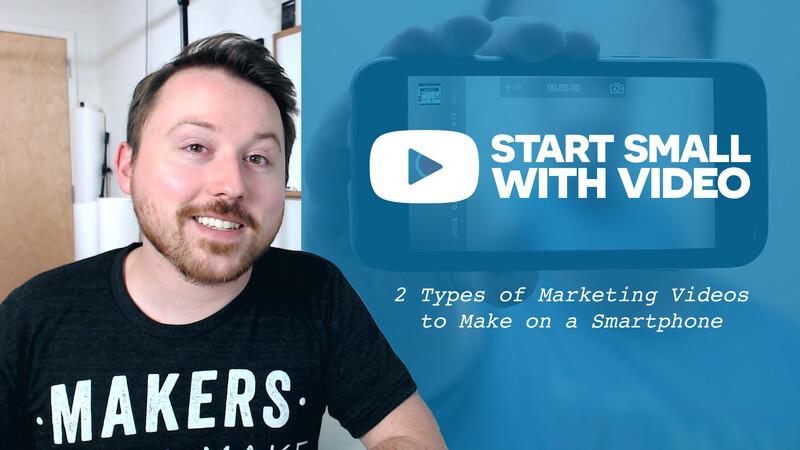 Today let’s focus on two specific kinds of short videos you can make quickly and simply with your smartphone. Its purpose is to answer one or more of the most common questions that you hear from your customers. The key is to focus on answering only the top questions that your customers have actually asked you. So why can a Q&A video work? It brings value immediately to the new people who are considering buying from you – they’re very likely wondering about the exact questions that you’re answering in your video. Plus a Q&A humanizes you in their eyes and personalizes their experience with you a bit more even though you’re not talking to them one-on-one; after all, in their eyes you’re taking the time to consider questions that they (likely) have and provide answers without them even having to ask. Its purpose is to show new customers what the experience is really like with your product or service. For a photographer this might be a look behind-the-scenes of a shoot, or simply seeing what a photo book or photo prints are like in hand. And, for a potter who makes mugs this might be a shot of her throwing a mug, or just making tea in one of her mugs. So why can a “What’s inside?” video work? As humans it seems we like to see “what’s inside” before we buy something because it helps create confidence in our decision to buy. You can make either a “Q&A” or a “What’s inside?” video by yourself in about an hour, and with minimal editing (if any). That first step of getting started is often times the hardest part, and I want to give you that push to just start. Take 10 minutes and write down 3 of the top questions your customers have asked you about your product or service lately. Choose the type of video you want to make: A Q&A or a “What’s inside?” video. Then grab your smartphone and film it.